To celebrate National Pork Month here, we’re going to spend the month talking about pigs! I had the chance to spend the day with my friend Heather who helps take care of a two-generation pig farm in Indiana. Over the next few weeks, we’ll be talking about how Heather and her family take care of their pigs so we can buy that yummy bacon! Heather’s farm is a farrow-to-finish farm. That means that they have sows that have piglets twice a year, and they raise the piglets until they are “finished” (ready to be sold to go to market). Their farm is a three-stage farm – all this means is they have three different buildings for the pigs. All their pigs are raised indoors. 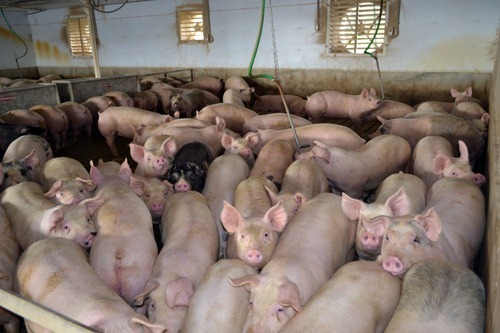 One of the big benefits of raising pigs indoors is the ability to control the temperature in their environment. The barns have heating and air conditioning so the temperature is just right for the pigs all year round. 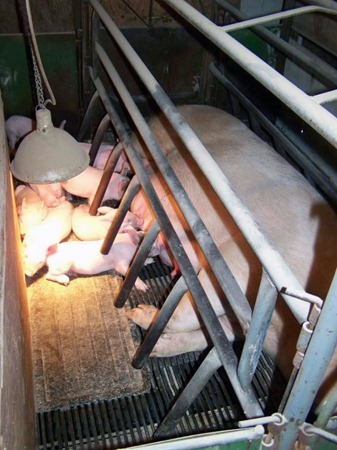 The piglets are born in a farrowing house. They stay here with their mothers until they are 3 weeks old, and then they are weaned. The farrowing house is kept at 70 degrees Fahrenheit. Each farrowing stall has heat lamps where the piglets can get a little warmer (the babies need to be warmer than the adults). After they are weaned, the piglets go to the nursery. They stay here until they are about 50 pounds, or 10 weeks old. The nursery is kept at a balmy 80 degrees Fahrenheit, whether it’s 100 degrees outside in the middle of summer or 20 degrees outside in the middle of winter. Finally, the piglets are moved to the finisher barn. 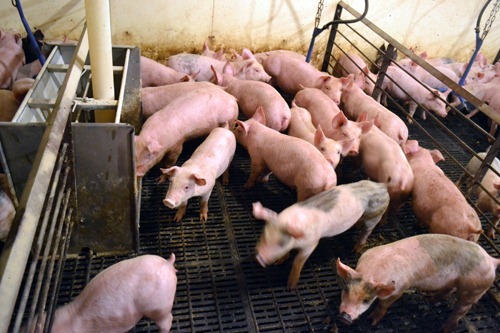 The pigs live in the finisher until they are around 280 pounds, or 26 weeks old. As the pigs get older and bigger, they don’t need the temperatures to be quite so warm. 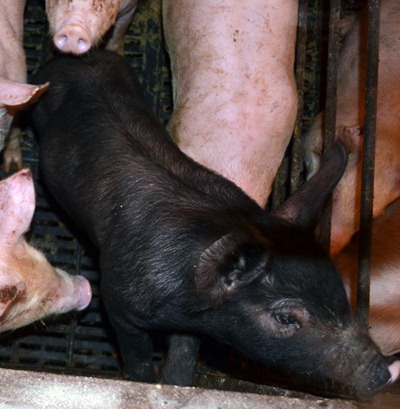 The temperature in the nursery is gradually decreased as the pigs get older, and by the time they are moved to the finisher they are in temperatures around 70 degrees Fahrenheit. These pigs were so curious that they all came right over to see what we were up to when we came into their room! Over the next few weeks, we’ll look at how Heather and her family take care of their pigs. We’ll talk about these different types of housing in a little more detail, and why they chose these types of barns. We’ll also talk about how these pigs are the ultimate environmentalists! What questions do you have about pigs? I’ll answer them this month! Thank you for your information. what do you give to newly born piglets? Jovia, every farm is a little different. Most farmers will give newborn piglets an iron shot and some vaccines. If you have pigs, you should consult with your veterinarian on what the best plan is for them. ARE YOU AWARE HOW INTELLIGENT PIGS ARE? Hi Bernadette. Thanks for your comment. I don’t raise pigs, but I have friends who do. I know these farmers very well, I know how they treat their families, and I know how they treat their pigs. I trust them to do what they think is best to keep their pigs comfortable, healthy, and happy. I also respect your opinion and choice to raise pigs in a different way.